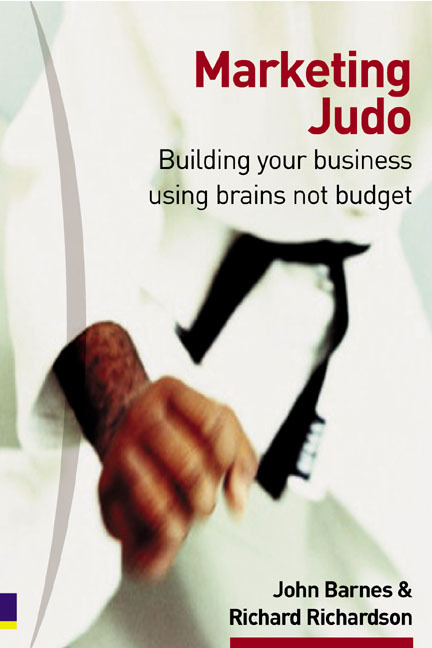 "I strongly advise anybody wanting to start up their own business to read Marketing Judo"
Marketing Judo aims to inspire people who want to build a brand or business but dont have the budgets for conventional marketing. Thats the position the authors found themselves in when they bought the one Harry Ramsdens fish and chip restaurant in Yorkshire over ten years ago. They fell into a way of thinking, which they now call Marketing Judo. In judo, you lever other peoples strengths or assets to your own advantage. In judo, your mind matters more than your size. In judo, anyone can become a black belt if they move quickly, train hard enough and keep their balance when others dont. Marketing Judo offers a framework for developing strategies and plans for small companies to do exactly that. It is a collection of real stories and events, from both the author's experiences and from other companies, from which the Marketing Judo principles evolved. Around the world, big companies have never been so vulnerable. Its always possible to find a competitive advantage, however big your opponent is, so join us on the "Tatami" or judo mat and learn how to use your brains rather than budgets, as we take you through the six principles of Marketing Judo. Available as a short, entertaining easy read book or as an audio CD or cassette, featuring the authors live in front of an audience of businesspeople in Leeds. "There are so many good tips in this book that it will be the best tenner's worth this year for anyone building a new business, whether you are starting from scratch or from inside a big corporation." "The best books these days come complete with complementary websites that are packed with further reading and inspiration. This punchy titled publication is no exception. This time further reading can be found at www.business-minds.com and www.yourmomentum.com The judo theme is well developed and runs throughout the book." "…an entertaining guide, packed with great examples from a variety of companies and relevant anecdotes." "I strongly advise anybody wanting to start up their own business to read 'Marketing Judo'. The book shows how you can take a very simple concept even in a "non fashionable" area and using like techniques and approach build that up into a massive business." "Modern business is only about flexibility of response and balance of organisation. The Judo metaphor is, therefore, perfect and I'll be amazed if readers don't get at least half a dozen new ideas for their businesses from this book. As a bonus, its a fun read"